Our manufactured Flowmeters are just perfect for your homes. It excels in providing accurate data with great ease. The polycarbonate housing extends over the lightweight aluminum body providing superior durability. The housing is impervious to chemical solutions normally used in a clinical setting. The state-of-the-art housing incorporates a white background that makes the flow settings easier to read. The contemporary design results in a smaller unit that fits more easily into space-cramped wall rails. 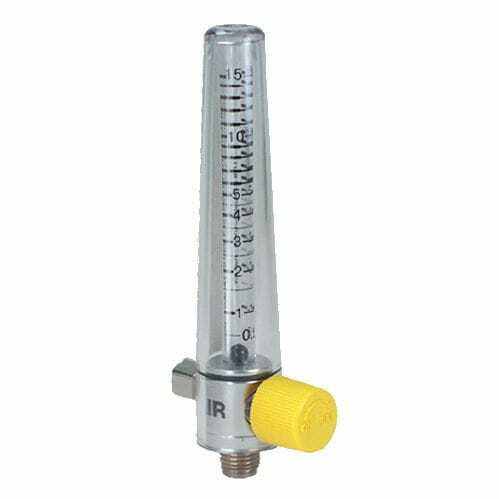 Unlike side-mounted knobs, which are susceptible to damage, the flow control knobs are on the front of the flowmeter in clear sight of the operator. Our flowmeters use black glass flow indicator balls. The properties of black glass, superior sphericity and exceptionally uniform density, ensure that the flowmeter is more accurate than flowmeters utilizing plastic floats. The flow tube has a lifetime warranty and the needle valve carries a five-year warranty.